Legends tell us of a place in the middle of the woods that is host to a special location where teddy bears from all over the world gather and enjoy small celebrations, a dance, and of course enjoy a range of delectable treats for teddy bear kind! But, would you be surprised to know that there is a second kind of bear gathering that is even more exciting? We're talking about the Gathering of the Gummies! When these sweet and multicolored bears get going, they can hardly ever be stopped! Is it the sugar? The gelatin construction? Who knows!? We're not convinced it will lead to the location of the gathering, but this Gummy Bears Fanny Pack might prove to be the key to granting you admission. 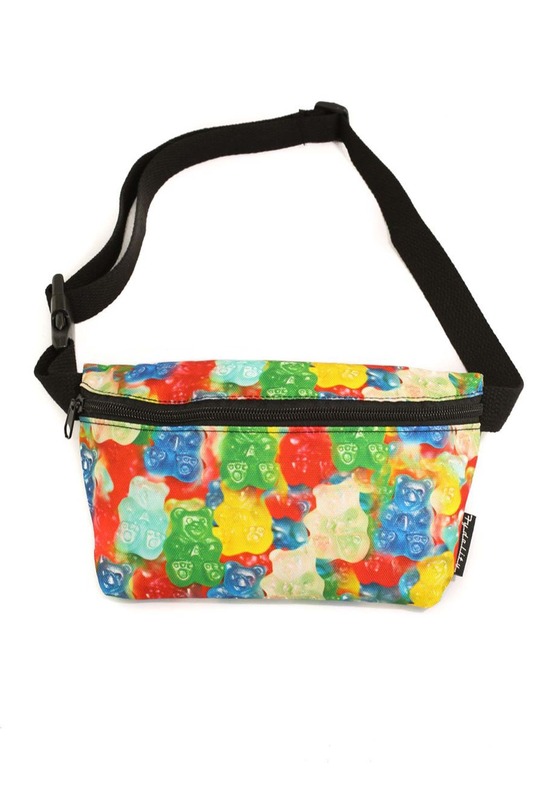 The bright design of dozens of gummy bears flocking together will make it look like they're on the journey with you while the 9"x5" dimensions of the pouch are sure to tote all your things! Getting to the hidden spots in the woods where the gummy bears have their magical gatherings seems like a thing no human could achieve... but what if you had the rainbow bridge to help you out!? Well, it might not be totally bridge-like, but this multicolored fanny pack might open up some new routes... even if it is just for snack storage.